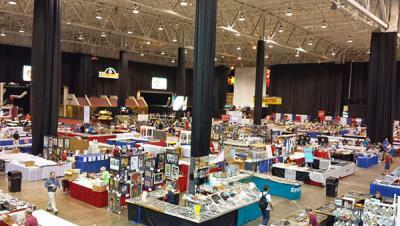 Five months out isn’t too early for a preview of the National Sports Collectors Convention, is it? A: Because despite my lack of involvement here, I’m quite familiar with the show, especially in Cleveland. I went to the entire week of the National in 2014, 2004, and 2001, as well as a single day in 1997. Aside from a kind of weak showing in 2004 (which may have been more because I had almost no spending money for it, rather than it actually being a weak showing), it has never failed to impress me on the sheer magnitude of the event: you won’t find more collectors in one place at one time ever. If I remember correctly, the 2014 show was the third most-attended National ever with somewhere around 45,000 collectors visiting the IX Center: well short of the record 100,000 at the 1991 Anaheim show, but much better than the 25,000 at the 1999 Atlanta show. Just one corner of the show floor in 2014. Q: Alright, fair enough, you got some chops. So, tell me then, as a first-timer, what should I expect at the show? A: If you haven’t ever been to a National, nothing I say can really do it justice until you see it for yourself. One of SCF’s members-- Stuart, AKA BSEBALLCOMMISH75 who attends nearly every year-- says his favorite thing to do is to walk in about ten feet ahead of a first-timer, then turn back and see their expression upon entering. Take the biggest show you’ve been to and double it. Now double it again. Maybe one or two more times. It’s massive. The size of the hall hits you first, followed by the fact that not only is it huge, but it’s covered end to end in nothing but sports collectibles of all kinds. Cards, autographs, art, jerseys, hats, books, magazines, videos, unopened packs, unopened boxes, unopened cases, ticket stubs, stadium seats, game-used items, baseball, football, basketball, hockey, soccer, auto racing, boxing, wrestling, non-sports, with release dates ranging from the 1800s to this past week, you’ll find it all there somewhere. Entering for the first time even still shocks me now despite having attended four of them already. The National has typically 22 aisles at the I-X Center. The Cleveland 2018 floor plan as has space for 515 booths at 10’x15’ each. And that doesn’t include designated “pavilion” areas. 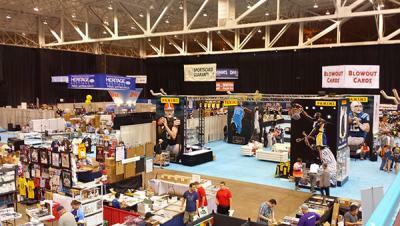 The corporate pavilion contains gigantic areas for Panini, Topps, Upper Deck, Leaf, SGC, Blowout Cards, Heritage Auctions, Dave & Adam’s, Beckett, PSA, and more (14 spaces that are at least 40’x50’, 17 that are at least 20’x25’). The autograph pavilion is run by Tristar and has all the show’s autograph guests (though occasionally Panini, Topps, and Upper Deck may bring in their own). The case breakers pavilion has some of the country’s top case breakers doing live breaks. There’s even a VIP lounge with tables and chairs if you need a place to kick back and relax for a bit. Of course, there are also some tables and chairs and benches near the food court too, in case you don’t want to stray too far; but if you want to avoid the hoi polloi and bought a VIP pass, head for the lounge. It’s what I imagine attending a World’s Fair would have been like back when they actually meant something. Q: I’m sure every organizer post-Expo 67 needs some aloe vera after that burn! A: Wow, in your face, HemisFair 68! Also, that wasn’t a question. A shot of the corporate pavilion area in 2014. Q: I’m surprised no one has ever made a documentary or something of the sort on this. Or have they? A: While it’s not a true documentary, nearly every year Bill Simmons goes to the show, often taking video, photos, doing a big write-up… basically Bill Simmons does Bill Simmons things because he’s Bill Simmons. Q: Are you required to mention him a number of times in an article? A: My contract says five. So, Bill Simmons. 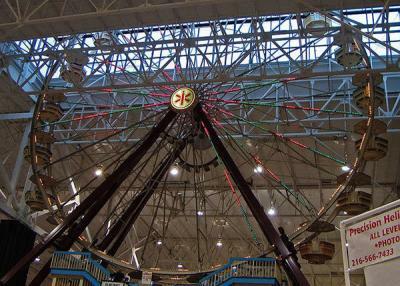 Oh yeah, as mentioned in the articles above and revisiting my earlier World’s Fair motif, there’s a giant indoor Ferris wheel. It was finished in 1992, 125 feet high, and used to be the world’s largest indoor Ferris wheel (as of 2012, the indoor record belongs to the Alem wheel in Ashgabat, Turkmenistan). It was so big they had to cut a hole in the roof (the ceiling is 77 feet) and enclose it with glass, so at the very top on a clear day, you can see all the way to Downtown Cleveland, which is ten miles away. It costs a couple bucks to ride. Totally worth it. Giant Ferris Wheel. Not even kidding. It's there. The first two photos were shot from the platform. Q: How did this building end up in as random a spot as Brook Park, Ohio? Or is it Cleveland now? 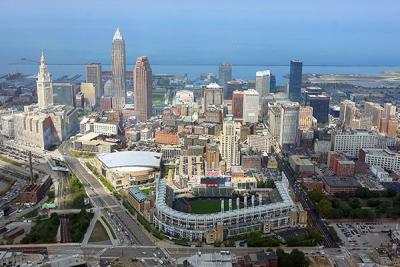 A: Cleveland did a land swap deal and now owns the land it’s on. The IX Center itself was originally a B-29 plant in World War Two, then made tanks during the Korean and Vietnam Wars. It also has served as a high school temporarily. Allegedly it has at least three basement levels including a giant pool for testing the watertightness of various tank designs and allegedly tunnels to the airport, the NASA Lewis Research Center, and maybe elsewhere. It’s unconfirmed as to whether these tunnels currently exist, or ever existed. Fun idea at least. Q: Huh, underground alien base? Q: What other events will be going on besides the show? A: The great thing about the National is that there’s not just a big memorabilia show. Some collectors may set up trading events in the conference rooms of local hotels. Browns’ Training Camp will be underway. The Indians play at home against the Angels. The Lake County Captains, Akron Rubber Ducks, Mahoning Valley Scrappers, and Lake Erie Crushers will all be playing at home. If you don’t mind a bit of a drive, the Toledo Mud Hens, Columbus Clippers, and Pittsburgh Pirates all will play at home and are within two hours of Cleveland. Got money to burn? Panini and Upper Deck offer VIP parties for their biggest spenders. Plus there’s all the greatness of the city itself. Q: Wait, seriously? You mean this city-- whose main river caught fire five times, had a mayor’s wife refuse an invitation to the White House because it conflicted with her bowling night, had that mayor's hair catch fire in a way unrelated to the river, and finally went bankrupt under another mayor who later went onto claim he was once abducted by a UFO-- is a great one? HA! A: Look, it was a bowling LEAGUE night for her, and a soon-to-be-scandal-ridden Nixon White House. And yes, it's great. The Rock and Roll Hall of Fame is downtown. One of the world’s greatest orchestras will be in the middle of their outdoor concert season. There’s a Polka Hall of Fame in Euclid, thus ending our musical awesomeness streak at two. The Pro Football Hall of Fame is a short drive away. The excellent Metroparks system (and that’s both the Cleveland Metroparks and the Lake Metroparks), including the zoo with its indoor rainforest. Cedar Point is an hour or so away for the roller coaster enthusiasts. For shopping, there are tons of malls in the area. You can see a great baseball museum that is housed in the remnants of League Park. There's the house where A Christmas Story was filmed, over in the Tremont neighborhood. And the food… Melt has everything imaginable on a grilled cheese sandwich. Iron Chef Michael Symon has his restaurants Lola, Mabel’s BBQ, B-Spot Burgers, and maybe Sherla’s Chicken and Oysters will even be open by then too. Hot Sauce Williams is the go-to spot for barbecue and especially a Polish Boy. Hit up Sokolowski’s for an Eastern European feast. Slyman’s Deli for incredible corned beef. Have your desserts at Malley’s Chocolates and East Coast Frozen Custard. Q: Wow. You had me at grilled cheese. And if you aren’t totally sportsed out, there are several card shops in the area. Cards and Games in Painesville in the former Puritan Bakery (it still smells like stale flour when you walk in), Sports N’ More in Mentor-on-the-Lake, C-Town Sports at the Great Lakes Mall in Mentor, Over The Fence in Eastlake, Brooklyn Sportscards in Brooklyn (obviously), B&B Sports Cards out in Fairview Park, and All-Star Collectibles and Action Sports Cards in Parma. A: Haha. Ghoulardi. Good one. Stay sick, turn blue! Q: So how does one go about getting to this? A: Cleveland Hopkins Airport (CLE) is right next to the IX Center. You’ll see the Center while taxiing in. Canton-Akron Regional (CAK) is less than an hour away. Other options within two hours include Detroit (DTW), Toledo (TOL), Columbus (CMH), and Pittsburgh (PIT). Amtrak runs into downtown. It's the best way to travel anywhere if you don’t have to be at your destination on time, so plan accordingly. Greyhound runs into downtown as well. I love Greyhound personally, but only for trips of under 10 hours. You'll also need to get to a car rental spot from any of these too, so be prepared. This year, I’m driving it which will be different, but provides a ton of autographing opportunities. In 1997 and 2001, I lived near Cleveland, while in 2004 and 2014 I flew in from Boston and Texas, respectively. My friend Arron is coming along (some of you may know him as elmesero5 on a few boards), and he and I are going to hit a ton of ballgames on the way up, while we’re there, and on the way back; if you’re reading this and graph any of these ballparks, please let me know! We’d love any intel we can get, and would love to hang out with other collectors when we’re there. All games are subject to change, void where prohibited, contents packed by weight not volume, ceci n’est pas une pipe. Q: Are there hotel deals? A: The National has sponsor hotels, though those will go quickly and tend to be a bit higher-end. I opted to get on Hotwire and find a good rate that way. So Arron and I are staying in Macedonia (as in the town in Summit County, NOT the country with Skopje as its capital). $460 for the week, which isn’t bad at all. If you fly in, rent a car for sure. Your hotel may offer transportation to the IX Center, but don’t count on it. Q: I hear there’s a VIP Bag. What’s in the VIP bag? A: Lots of freebies from card companies and other sponsors. You’ll get small promo sets from Topps, Upper Deck, Panini, and Leaf, plus maybe some coupons, magazines, and of course your program and autograph tickets. Get the VIP pass and you’ll get all of that. Get the SuperVIP pass, and you’ll get TWO of everything. Q: What’s the best day to buy? A: Buy anything you have to have as soon as you see it. But wait until Saturday or Sunday to do some bargain hunting. Personally, I plan to quickly visit tables Wednesday and early Thursday and mark down some to check more extensively later. I’ll spend time searching the ones I wrote down on Thursday and Friday, and probably do most of my buying late Friday and Saturday. 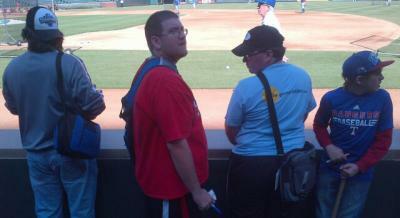 Q: If you want autographs, is the All-Access upgrade worth it? A: From what I can tell, YES. I stood hours in autograph lines in 2014. I saw people with it who could have looped the line 10 times if they wanted to (fortunately even if you have 50 items to get signed, as long as you have 50 tickets you can do them all at once and not have to take one item and one ticket at one trip). It’s worth an extra $100 to have significantly less of a wait. Q: What percentage of collectibles are modern and what percentage are vintage? A: I feel like there’s more vintage, but not immensely so. I’d guess about 60/40. It’s all about demand and vintage will ALWAYS be in demand. If you’re only needing modern stuff, you’ll find plenty of tables with it. Singles, boxes, cases, high-end, low-end, old, new, graded, raw, someone will have something you need. In most cases, several will have it. Are you mostly getting autographs? Have something to get signed and you’re all set. TriStar supplies all the pens that you might need-- I saw blue and black Sharpies, silver and gold paint pens, blue and black ballpoints, and even blue Staedtler. If you’re super-specific about what you want it signed with, then bring that, but for the most part it’s covered just fine. Are you looking to fill needs for a set or a player collection? Simply bring a want list, a box to put your cards in after you pay for them, and a bag for easy carrying. Maybe some sleeves and toploaders. A foldable stool might be a good idea as well. I’ll also have a 1600-count box in the car to put everything in at the end of the day. Are you looking to sell? Don’t bring too much: dealers usually don’t do much buying the first few days, and even when they do it’s likely to be higher-end stuff. So don’t come in with a couple gigantic boxes of commons. No matter what, comfortable shoes, a bag (messenger or backpack), some small snacks, and money. You can have a good experience on any amount, but the more the better. Think of what you’d want to get, look for approximate prices to expect. Then double it because you’ll find things you want that you didn’t even think of. But know your limits and only bring what you are comfortable with leaving at a table. Snacks like a sandwich, some almonds or carrot sticks, and a bottle of water are good to have in your bag since food can be a bit expensive inside, and there are no restaurants near the grounds. Hand sanitizer and breath mints are a good idea too. Have the floor plan handy. There will be a map of it in the program, also on the National website so you can print a copy or two ahead of time. Mark on it what booths you want to visit again. Visit the manufacturer booths, even just to see what they are all about for the next year's offerings. You never know what freebies they may have stashed behind the table. Some even have their own autograph guests during the week. If you are going for the autograph guests, be sure to keep an eye on the time. Lines can get long and if you wait too long to jump in, you may miss who you are interested in. Plan on at least two days if you can: it’s hard to see everything in one day. If you’re limited to a single day, I would recommend Saturday: get there as soon as the doors open, leave at the last possible moment. Talk to anyone and everyone-- even on your hotel shuttle! You never know who might be able to help you with your collection. Be friendly to the dealers, the staff, and to everyone really. It can go a long way. Keep an eye on SCF and other sites in the time leading up to the show. Don’s annual National thread is a good way to find people who are going and connect with them beforehand. They may be able to help you if they come across something you need-- or if you come across something they need. Networking is important at a huge event like this. So, I hope that helps you out. And of course, I look forward to seeing all the members of SCF who come in for the show. ABOUT THE AUTHOR: Drew Pelto is clearly bat-guano insane, as displayed via interviewing himself for this column, his love for Cleveland, and for his probably-unsustainable schedule of ‘graphing on the trip. He lives in Texas with his wife, two cats, and several thousand autographs. THAT is an absolutely FANTASTIC article; thanks for the great read! Thanks! If you can't tell, I've been looking forward to this since the 2014 show, and have been planning it for like a year and a half. Completely geeked as well that the first few VIP signers were just named-- Gregg Jefferies, Benito Santiago, Marty Cordova, and Charles White. I need two of them for autograph projects. I also just noticed I need to switch and put BG-LC on Friday and Indians-Angels Saturday. Captains have an Omar Vizquel bobblehead giveaway! Seems the Writing Team is dead or possibly on life support. Here's video of my trip over the summer, including the National. Nice video did not have time to watch it all as it over a hour long. How long did it take you to put that video together of the show and all your road trips? Very nice video and the writing team is definitely on life support lol. Hope all is well on your end with the cards and the job. It took a full day of work through Windows Movie Maker on my old (read: slow) laptop. I took video in each city, cut it down individually for each section, and compiled those into chunks to start, then finally stuck all the pieces together for the final project. It likely would go faster on my new computer. I'm planning on doing a roadtrip again in 2022 for the National, but longer. I might actually have a plan for how to do the video for that one instead of the fly-by-the-seat-of-my-pants job that this video ended up being. I probably will try to do individual daily videos then instead of this monstrosity. Also, not sure if anyone noticed but yes, that is the This Week In Baseball music on the intro and outro.